In West Eurasia, agriculture lead to widespread genetic changes[clarification needed] when older hunter-gatherer populations were largely replaced by Middle Eastern farmers during the Neolithic who in turn were overrun by Indo-Europeans during the Bronze Age. Only a few contemporary societies are classified as hunter-gatherers, and many supplement their foraging activity with horticulture or pastoralism. During the 1970s, Lewis Binford suggested that early humans were obtaining food via scavenging, not hunting. Early humans in the Lower Paleolithic lived in forests and woodlands, which allowed them to collect seafood, eggs, nuts, and fruits besides scavenging. Rather than killing large animals for meat, according to this view, they used carcasses of such animals that had either been killed by predators or that had died of natural causes. Archaeological and genetic data suggest that the source populations of Paleolithic hunter-gatherers survived in sparsely wooded areas and dispersed through areas of high primary productivity while avoiding dense forest cover. Hunting and gathering was presumably the subsistence strategy employed by human societies beginning some 1.8 million years ago, by Homo erectus, and from its appearance some 0.2 million years ago by Homo sapiens. Prehistoric hunter-gatherers lived in groups that consisted of several families resulting in a size of a few dozen people. It remained the only mode of subsistence until the end of the Mesolithic period some 10,000 years ago, and after this was replaced only gradually with the spread of the Neolithic Revolution. Starting at the transition between the Middle to Upper Paleolithic period, some 80,000 to 70,000 years ago, some hunter-gatherers bands began to specialize, concentrating on hunting a smaller selection of (often larger) game and gathering a smaller selection of food. This specialization of work also involved creating specialized tools such as fishing nets, hooks, and bone harpoons. The transition into the subsequent Neolithic period is chiefly defined by the unprecedented development of nascent agricultural practices. Agriculture originated as early as 12,000 years ago in the Middle East, and also independently originated in many other areas including Southeast Asia, parts of Africa, Mesoamerica, and the Andes. Forest gardening was also being used as a food production system in various parts of the world over this period. Forest gardens originated in prehistoric times along jungle-clad river banks and in the wet foothills of monsoon regions. In the gradual process of families improving their immediate environment, useful tree and vine species were identified, protected and improved, whilst undesirable species were eliminated. Eventually superior introduced species were selected and incorporated into the gardens. 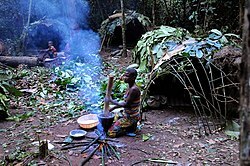 Many groups continued their hunter-gatherer ways of life, although their numbers have continually declined, partly as a result of pressure from growing agricultural and pastoral communities. Many of them reside in the developing world, either in arid regions or tropical forests. Areas that were formerly available to hunter-gatherers were—and continue to be—encroached upon by the settlements of agriculturalists. In the resulting competition for land use, hunter-gatherer societies either adopted these practices or moved to other areas. In addition, Jared Diamond has blamed a decline in the availability of wild foods, particularly animal resources. In North and South America, for example, most large mammal species had gone extinct by the end of the Pleistocene—according to Diamond, because of overexploitation by humans, one of several explanations offered for the Quaternary extinction event there. 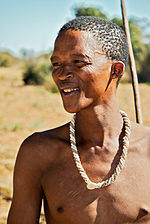 Most hunter-gatherers are nomadic or semi-nomadic and live in temporary settlements. Mobile communities typically construct shelters using impermanent building materials, or they may use natural rock shelters, where they are available. Some hunter-gatherer cultures, such as the indigenous peoples of the Pacific Northwest Coast and the Yakuts, lived in particularly rich environments that allowed them to be sedentary or semi-sedentary. Hunter-gatherers tend to have an egalitarian social ethos, although settled hunter-gatherers (for example, those inhabiting the Northwest Coast of North America) are an exception to this rule. Nearly all African hunter-gatherers are egalitarian, with women roughly as influential and powerful as men. Karl Marx defined this socio-economic system as primitive communism. Anthropologists maintain that hunter/gatherers don't have permanent leaders; instead, the person taking the initiative at any one time depends on the task being performed. In addition to social and economic equality in hunter-gatherer societies, there is often, though not always, sexual parity as well. Hunter-gatherers are often grouped together based on kinship and band (or tribe) membership. Postmarital residence among hunter-gatherers tends to be matrilocal, at least initially. Young mothers can enjoy childcare support from their own mothers, who continue living nearby in the same camp. The systems of kinship and descent among human hunter-gatherers were relatively flexible, although there is evidence that early human kinship in general tended to be matrilineal. One common arrangement is the sexual division of labour, with women doing most of the gathering, while men concentrate on big game hunting. In all hunter-gatherer societies, women appreciate the meat brought back to camp by men. An illustrative account is Megan Biesele's study of the southern African Ju/'hoan, 'Women Like Meat'. Recent archaeological research suggests that the sexual division of labor was the fundamental organisational innovation that gave Homo sapiens the edge over the Neanderthals, allowing our ancestors to migrate from Africa and spread across the globe. A 1986 study found most hunter-gatherers have a symbolically structured sexual division of labour. However, it is true that in a small minority of cases, women hunt the same kind of quarry as men, sometimes doing so alongside men. The best-known example are the Aeta people of the Philippines. According to one study, "About 85% of Philippine Aeta women hunt, and they hunt the same quarry as men. Aeta women hunt in groups and with dogs, and have a 31% success rate as opposed to 17% for men. Their rates are even better when they combine forces with men: mixed hunting groups have a full 41% success rate among the Aeta. "[failed verification] Among the Ju'/hoansi people of Namibia, women help men track down quarry. Women in the Australian Martu also primarily hunt small animals like lizards to feed their children and maintain relations with other women. At the same conference, Marshall Sahlins presented a paper entitled, "Notes on the Original Affluent Society", in which he challenged the popular view of hunter-gatherers lives as "solitary, poor, nasty, brutish and short", as Thomas Hobbes had put it in 1651. According to Sahlins, ethnographic data indicated that hunter-gatherers worked far fewer hours and enjoyed more leisure than typical members of industrial society, and they still ate well. Their "affluence" came from the idea that they were satisfied with very little in the material sense. Later, in 1996, Ross Sackett performed two distinct meta-analyses to empirically test Sahlin's view. The first of these studies looked at 102 time-allocation studies, and the second one analyzed 207 energy-expenditure studies. Sackett found that adults in foraging and horticultural societies work, on average, about 6.5 hours a day, whereas people in agricultural and industrial societies work on average 8.8 hours a day. Researchers Gurven and Kaplan have estimated that around 57% of hunter-gatherers reach the age of 15. Of those that reach 15 years of age, 64% continue to live to or past the age of 45. This places the life expectancy between 21 and 37 years. They further estimate that 70% of deaths are due to diseases of some kind, 20% of deaths come from violence or accidents and 10% are due to degenerative diseases. Hunter-gatherer societies manifest significant variability, depending on climate zone/life zone, available technology, and societal structure. Archaeologists examine hunter-gatherer tool kits to measure variability across different groups. Collard et al. (2005) found temperature to be the only statistically significant factor to impact hunter-gatherer tool kits. Using temperature as a proxy for risk, Collard et al. 's results suggest that environments with extreme temperatures pose a threat to hunter-gatherer systems significant enough to warrant increased variability of tools. These results support Torrence's (1989) theory that risk of failure is indeed the most important factor in determining the structure of hunter-gatherer toolkits. Nowadays, some scholars speak about the existence within cultural evolution of the so-called mixed-economies or dual economies which imply a combination of food procurement (gathering and hunting) and food production or when foragers have trade relations with farmers. In the early 1980s, a small but vocal segment of anthropologists and archaeologists attempted to demonstrate that contemporary groups usually identified as hunter-gatherers do not, in most cases, have a continuous history of hunting and gathering, and that in many cases their ancestors were agriculturalists or pastoralists who were pushed into marginal areas as a result of migrations, economic exploitation, or violent conflict (see, for example, the Kalahari Debate). The result of their effort has been the general acknowledgement that there has been complex interaction between hunter-gatherers and non-hunter-gatherers for millennia. There are nevertheless a number of contemporary hunter-gatherer peoples who, after contact with other societies, continue their ways of life with very little external influence or with modifications that perpetuate the viability of hunting and gathering in the 21st century. One such group is the Pila Nguru (Spinifex people) of Western Australia, whose habitat in the Great Victoria Desert has proved unsuitable for European agriculture (and even pastoralism). Another are the Sentinelese of the Andaman Islands in the Indian Ocean, who live on North Sentinel Island and to date have maintained their independent existence, repelling attempts to engage with and contact them. 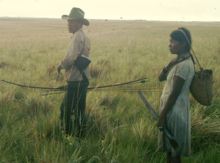 The Savanna Pumé of Venezuela also live in an area that is inhospitable to large scale economic exploitation and maintain their subsistence based on hunting and gathering, as well as incorporating a small amount of manioc horticulture that supplements, but is not replacing, reliance on foraged foods. Evidence suggests big-game hunter-gatherers crossed the Bering Strait from Asia (Eurasia) into North America over a land bridge (Beringia), that existed between 47,000–14,000 years ago. Around 18,500–15,500 years ago, these hunter-gatherers are believed to have followed herds of now-extinct Pleistocene megafauna along ice-free corridors that stretched between the Laurentide and Cordilleran ice sheets. Another route proposed is that, either on foot or using primitive boats, they migrated down the Pacific coast to South America. The Archaic period in the Americas saw a changing environment featuring a warmer more arid climate and the disappearance of the last megafauna. The majority of population groups at this time were still highly mobile hunter-gatherers. Individual groups started to focus on resources available to them locally, however, and thus archaeologists have identified a pattern of increasing regional generalization, as seen with the Southwest, Arctic, Poverty Point, Dalton and Plano traditions. These regional adaptations would become the norm, with reliance less on hunting and gathering, with a more mixed economy of small game, fish, seasonally wild vegetables and harvested plant foods. 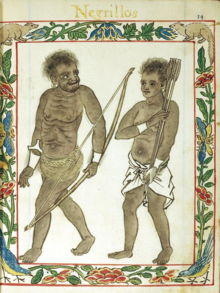 Negritos in the Philippines, 1595. Contrary to common misconception, hunters and gatherers are mostly well fed, rather than starving. ^ Lee, Richard B.; Daly, Richard Heywood (1999). Cambridge Encyclopedia of Hunters and Gatherers. Cambridge University Press. p. inside front cover. ISBN 9780521609197. ^ "Ancient DNA reveals 'continuity' between Stone Age and modern populations in East Asia". ^ a b Codding, Brian F.; Kramer, Karen L., eds. (2016). Why Forage? Hunters and Gatherers in the Twenty-first Century. Santa Fe, Albuquerque: School for Advanced Research, University of New Mexico Press. ISBN 9780826356963. ^ Greaves, Russell D.; et al. (2016). "Economic activities of twenty-first century foraging populations". Why Forage? Hunters and Gatherers in the Twenty-First Century. Santa Fe, Albuquerque: School for Advanced Research, University of New Mexico Press. pp. 241–262. ISBN 9780826356963. ^ Binford, Louis (1986). "Human ancestors: Changing views of their behavior". Journal of Anthropological Archaeology. 3: 235–57. ^ Gavashelishvili, A.; Tarkhnishvili, D. (2016). "Biomes and human distribution during the last ice age". Global Ecology and Biogeography. 25 (5): 563. doi:10.1111/geb.12437. ^ Groeneveld, Emma (9 December 2016). "Prehistoric Hunter-Gatherer Societies". Ancient History Encyclopedia. Retrieved 9 April 2018. ^ Fagan, B: People of the Earth, pages 169–81. Scott, Foresman, 1989. ^ Jared Diamond (1998). Guns, Germs and Steel. London: Vintage. ISBN 0-09-930278-0. ^ Blades, B (2003). "End scraper reduction and hunter-gatherer mobility". American Antiquity. 68: 141–156. doi:10.2307/3557037. JSTOR 3557037. ^ Karen Endicott 1999. "Gender relations in hunter-gatherer societies". In R.B. Lee and R. Daly (eds), The Cambridge Encyclopedia of Hunters and Gatherers. Cambridge: Cambridge University Press, pp. 411–8. ^ Christopher Boehm (2001), Hierarchy in the Forest: The Evolution of Egalitarian Behavior, Cambridge, Massachusetts: Harvard University Press. ^ a b Gowdy, John M. (1998). Limited Wants, Unlimited Means: A Reader on Hunter-Gatherer Economics and the Environment. St Louis: Island Press. p. 342. ISBN 1-55963-555-X. ^ a b Dahlberg, Frances (1975). Woman the Gatherer. London: Yale University Press. ISBN 0-300-02989-6. ^ Marlowe, Frank W. (2004). "Marital residence among foragers". Current Anthropology. 45 (2): 277–284. doi:10.1086/382256. ^ Hawkes, K.; O'Connell, J. F.; Jones, N. G. Blurton; Alvarez, H. P.; Charnov, E. L. (1998). "Grandmothering, Menopause, and the Evolution of Human Life-Histories". Proceedings of the National Academy of Sciences of the United States of America. 95 (3): 1336–9. doi:10.1073/pnas.95.3.1336. PMC 18762. PMID 9448332. ^ Knight, C. 2008. "Early human kinship was matrilineal". In N. J. Allen, H. Callan, R. Dunbar and W. James (eds. ), Early Human Kinship. Oxford: Blackwell, pp. 61–82. ^ Bird, Rebecca Bliege; Bird, Douglas W. (2008-08-01). "Why women hunt: risk and contemporary foraging in a Western Desert aboriginal community". Current Anthropology. 49 (4): 655–693. doi:10.1086/587700. ISSN 0011-3204. PMID 19230267. ^ Sahlins, M. (1968). "Notes on the Original Affluent Society", Man the Hunter. R.B. Lee and I. DeVore (New York: Aldine Publishing Company) pp. 85–89. ISBN 0-202-33032-X. See also: Jerome Lewis, "Managing abundance, not chasing scarcity" Archived May 13, 2013, at the Wayback Machine, Radical Anthropology, No.2, 2008, and John Gowdy, '"Hunter-Gatherers and the Mythology of the Market", in Lee, Richard B (2005). Cambridge Encyclopedia of Hunters and Gatherers. ^ Guenevere, Michael; Kaplan, Hillard (2007). "Longevity amongst Hunter-gatherers" (PDF). Population and Development Review. 33 (2): 326. doi:10.1111/j.1728-4457.2007.00171.x. ^ Torrence, Robin (1989). "Retooling: Towards a behavioral theory of stone tools". In Torrence, Robin (ed.). Time, Energy and Stone Tools. Cambridge University Press. pp. 57–66. ISBN 9780521253505. ^ Kelly, Robert L. (1995). The Foraging Spectrum: Diversity in Hunter-Gatherer Life ways. Washington: Smithsonian Institution. ISBN 1-56098-465-1. ^ Portera, Claire C.; Marlowe, Frank W. (January 2007). "How marginal are forager habitats?" (PDF). Journal of Archaeological Science. 34 (1): 59–68. doi:10.1016/j.jas.2006.03.014. Archived from the original (PDF) on February 27, 2008. ^ Lee, Richard B.; Daly, Richard, eds. (1999). The Cambridge Encyclopedia of Hunters and Gatherers. Cambridge University Press. ISBN 0-521-60919-4. ^ Hayes-Bohanan, Pamela (2010). Birx, H. James (ed.). "42: Prehistoric Cultures". 21st Century Anthropology: A Reference Handbook. 1: 409–418. ISBN 9781452266305 – via Gale Virtual Reference Library. ^ Kelly, Raymond (October 2005). "The evolution of lethal intergroup violence". PNAS. 102 (43): 15294–8. doi:10.1073/pnas.0505955102. PMC 1266108. PMID 16129826. ^ Wilmsen, Edwin (1989). Land Filled With Flies: A Political Economy of the Kalahari. University of Chicago Press. ISBN 0-226-90015-0. ^ Lee, Richard B.; Guenther, Mathias (1995). "Errors Corrected or Compounded? A Reply to Wilmsen". Current Anthropology. 36 (2): 298–305. doi:10.1086/204361. ^ Lee, Richard B. (1992). "Art, Science, or Politics? The Crisis in Hunter-Gatherer Studies". American Anthropologist. 94: 31–54. doi:10.1525/aa.1992.94.1.02a00030. ^ Shultziner, Doron (2010). "The causes and scope of political egalitarianism during the Last Glacial: A multi-disciplinary perspective". Biology and Philosophy. 25 (3): 319–346. doi:10.1007/s10539-010-9196-4. ^ Peterson, Nicolas; Taylor, John (1998). "Demographic transition in a hunter-gatherer population: the Tiwi case, 1929–1996". Australian Aboriginal Studies. Australian Institute of Aboriginal and Torres Strait Islander Studies. 1998. ^ Pandya, Vishvajit (2009). In the Forest: Visual and Material Worlds of Andamanese History (1858–2006). University Press of America. p. 357. ISBN 978-0-7618-4272-9. OCLC 673383888. ^ "North Sentinel Island: A Glimpse Into Prehistory". YouTube. Retrieved 30 May 2017. ^ Kramer, Karen L.; Greaves, Russell D. (2016). "Diversify or replace: what happens when cultigens are introduced into hunter-gatherer diets.". In Codding, Brian F.; Kramer, Karen L. (eds.). Why Forage? Hunters and Gatherers in the Twenty-First Century. Santa Fe, Albuquerque: School for Advanced Research Press and University of New Mexico Press. pp. 15–42. ISBN 9780826356963. ^ "Atlas of the Human Journey-The Genographic Project". National Geographic Society. 1996–2008. Archived from the original on 2011-05-01. Retrieved 2009-10-06. ^ "Alternate Migration Corridors for Early Man in North America". American Antiquity. 1. 44: 2. January 1979. JSTOR 279189. ^ Eshleman, Jason A.; Malhi, Ripan S.; Smith, David Glenn (2003). "Mitochondrial DNA Studies of Native Americans: Conceptions and Misconceptions of the Population Prehistory of the Americas" (pdf). Evolutionary Anthropology. University of Illinois at Urbana–Champaign. 12: 7–18. doi:10.1002/evan.10048. Retrieved 2009-11-17. ^ Fiedel, Stuart J. (1992). Prehistory of the Americas. Cambridge University Press. p. 151. ISBN 978-0-521-42544-5. Retrieved 2009-11-18. ^ Stuart B. Schwartz, Frank Salomon (1999-12-28). The Cambridge History of the Native Peoples of the Americas. Cambridge University Press. ISBN 978-0-521-63075-7. Retrieved 2009-11-17. Codding, Brian F.; Kramer, Karen L., eds. (2016). Why forage? : hunters and gatherers in the twenty-first century. Santa Fe, Albuquerque: School for Advanced Research Press, University of New Mexico Press. ISBN 9780826356963. Lee, Richard B.; DeVore, Irven, eds. (1968). Man the hunter. Aldine de Gruyter. ISBN 0-202-33032-X. Meltzer, David J. (2009). 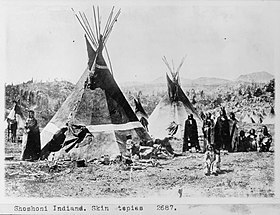 First peoples in a new world: colonizing ice age America. Berkeley: University of California. ISBN 0-520-25052-4. Morrison, K. D.; L. L. Junker, eds. (2002). Forager-traders in South and Southeast Asia: long term histories. Cambridge University Press. ISBN 0-521-01636-3. Panter-Brick, C.; R. H. Layton; P. Rowley-Conwy, eds. (2001). Hunter-gatherers: an interdisciplinary perspective. Cambridge University Press. ISBN 0-521-77672-4. Nakao, Hisashi; Tamura, Kohei; Arimatsu, Yui; Nakagawa, Tomomi; Matsumoto, Naoko; Matsugi, Takehiko (30 March 2016). "Violence in the prehistoric period of Japan: the spatio-temporal pattern of skeletal evidence for violence in the Jomon period". Biology Letters. The Royal Society publishing. 12 (3): 20160028. doi:10.1098/rsbl.2016.0028. PMC 4843228. Our results suggest that the mortality due to violence was low and spatio-temporally highly restricted in the Jomon period, which implies that violence including warfare in prehistoric Japan was not common. Ember, Carol R. "Hunter Gatherers (Foragers)". Explaining Human Culture. Human Relations Area Files. Retrieved 22 February 2018. Most cross-cultural research aims to understand shared traits among hunter-gatherers and how and why they vary. Here we look at the conclusions of cross-cultural studies that ask: What are recent hunter-gatherers generally like? How do they differ from food producers? How and why do hunter-gatherers vary? The Association of Foragers: An international association for teachers of hunter-gatherer skills. Balmer, Yves (2013). "Ethnological videos clips. Living or recently extinct traditional tribal groups and their origins". Andaman Association. Archived from the original on January 11, 2014.